Simon Says: Do your homework. Just because I wear a funny hat, though, doesn’t make me the Pope. At a high level, true platforms incorporate two types of developer building blocks: APIs and SDKs. (This is a key point in The Age of the Platform.) A company that doesn’t use either, if not both, is just paying lip service to the notion of platform thinking. Think marketing more than reality. Put differently, APIs and SDKs are necessary but not sufficient conditions for building a successful platform. Without them, a company simply cannot attract increasingly critical developers. With APIs and SDKs, nothing is guaranteed. 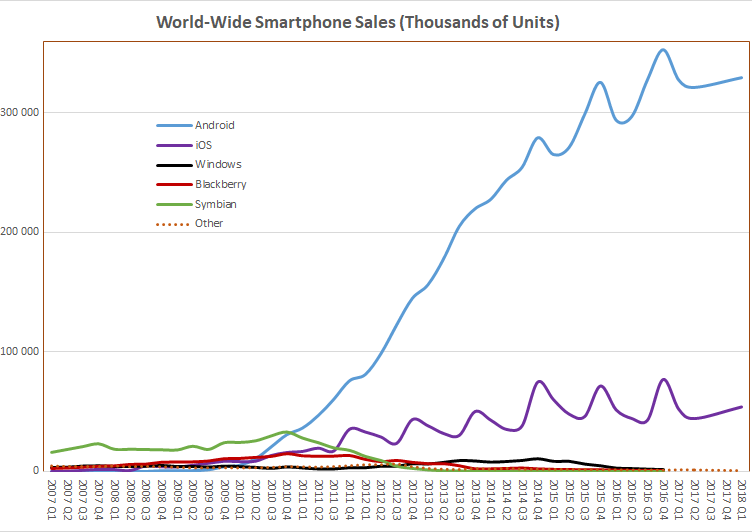 Just ask Microsoft and BlackBerry, two companies resigned to irrelevance in the smartphone wars. True platforms incorporate two types of building blocks: APIs and SDKs. But it is downright silly to think of an API as a binary. It’s not. Rather, there are many different types of APIs. (For more on this, see Proprietary APIs: A New Tool in the Age of the Platform.) The sooner that organizations and their leaders understand this, the quicker they’ll be able to reap the ample rewards that platforms can confer. Free: API provided for free; usually done to attract consumers or promote APIs. Developer Pays: Developer has to pay for the API or its usage. Pay as You Go: Common model for cloud-based APIs: developer pays only for parts of API currently being used; typically allows easy scaling up or down upon developer’s needs. Freemium: Basic version of API provided for free; developers can switch any time to a premium version that doesn’t have limitations but must be paid for. Unit-Based: Developers must pay based on number of API calls made; calls are typically grouped into units (e.g., by call type) and billed as such (e.g., per 1000 API calls). Tiered: Amount developers must pay depends on price tier; tier determined by predefined factor (e.g., total number of calls per month, amount of provider resources required). Transaction Fee: API provider takes cut from every transaction done through API. Developer Gets Paid: Developer gets paid by the API provider). Rev-Share: Provider shares percentage of revenue earned through use of API (e.g., revenue from advertising). Affiliate: Provider pays developers based on specific agreement. Usually, this model is used with advertising (i.e., CPA [cost per action/acquisition], CPC [cost per click], or CPM [cost per mile]) or customer referral. Latter can be one time (e.g., paid for every new customer signup) or recurring (e.g., paid every month as long as referred customer stays subscribed). Indirect: Covers models with indirect methods of payment or revenue. Content Acquisition: APIs used to gather valuable data (for the provider’s business) from users —e.g., advertisements, posts, listings, feedback, opinions. SaaS: APIs that go together with/or are part of SaaS business model; can be included into a base SaaS offering or used as an additional benefit in an upsell. Content Syndication: Making content (e.g., news, articles) available to be published by other parties with the goal of getting wider exposure. Internal Use: APIs aimed at internal use; can be consumer-facing (public Web, mobile/devices) or internal facing (SOA+, Web/mobile). The factors above beg the question: What does this all mean for third parties? Many things, but here’s one chilling thought. Let’s say that you envision your app seamlessly retrieving data from external sources. Wouldn’t it be cool to plug into a powerful, popular, and data-rich API like Netflix’s? Sounds great, but you may be out of luck. Netflix effectively shut down its public API more than a year ago. That may very well scuttle your plans from the get-go. And make no mistake, Netflix is hardly alone here. Twitter and LinkedIn have also earned the ire of many developers by severely restricting or eliminating access to their APIs. This post comes from IBM for MSPs and its opinions only reflect my own.